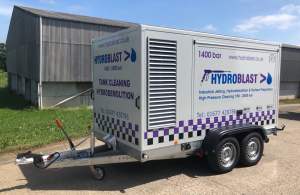 Hydroblast’s 2018 year goes from strength to strength. With increased work demands, we required further investment to offer our clients the best service possible with additional equipment. Investing in the latest water jetting technology is key to our expansion and strategy, in leading the way in the market and staying ahead of competition. Recently, we made the decision to purchase a reliable new machine that could help us to reduce our impact on the environment, meet our ISO 14001 goal and improve our operations. Last year this was a UHP trailer that delivers pressure and flow up to 3000 bar, 30lpm. This included reducing fuel consumption with the latest engine, reliability, quality, lower emissions with Adblue, and noise reduction. We were so impressed with the manufacturer who has designed such a high class unit, that we purchased the second unit in less than 12 months with a further £150,000 investment. The all new unit provided the solution, and it is again the first of its kind in the UK. It is very powerful, and it can achieve 2800 bar pressure at 40 litres per minute, or 1400 bar at 78 litres. Our experienced water jetting mechanics are able to convert the head in relatively quick time with refresher one-to-one tuition carried out directly at the factory. An ideal tool to have in our fleet for tank cleaning or Automated water jetting, specifically Robot Hydrodemolition. This sits in the middle of our fleet in terms of flow rate from 20lpm-260lpm. The machine gives us greater flexible and versatility if the water supply is poor at the client’s site. Not forgetting that discharging the waste water is just as important to our environmental goals and helps to reduce costs where possible. It can be sometimes be underestimated the importance in flow rate when choosing the most effective pump available for productivity and efficiency. Again, we have opted for an easy to transport, 4-wheeled, road-going trailer. The weight of the unit was something to consider when purchasing, however our fleet of Mercedes sprinters is capable of pulling 3.5 tonnes with ease. The weight for this specification pump is similar to those in the market with less pump performance which is some achievement. 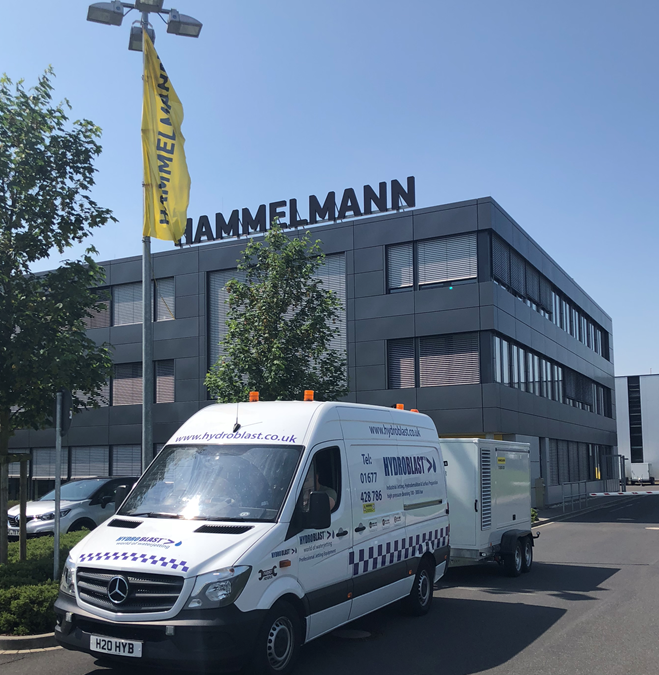 Our Operations Director Ross McDonald who collected the machine from Germany this week said, “it is surprise how beautiful it tows and handles behind the van. We have had trailers from manufactures over 3 tonnes in the past and have been terrible to pull. It’s stable, and has got good weight distribution meaning you can hardly tell you are pulling such weight. Plus i think it looks the part with its new livery. Our brand is easily recognisable due to the latest and best equipment we operate which is what makes us stand out, and we are proud of, especially marking the 20th pump in current operations”. We have again opted for the sound dampening body work and fully enclosed design. This means the machine is very quiet which makes all the difference to some of our customers. Again, an important factor to consider on this investment compared to ‘cheaper’ alternatives in the market. The trailer features a bunded bottom tray, meaning that no drip mats are necessary. It is equipped with an onboard nozzle calculator that means the machine will run at its optimal performance by having the correct size jet. The pump also offers increased service intervals with the manufacturer quoting 1400 hours before any work is required. This offers a huge saving on Maintenance cost and spare parts unlike other equipment whose parts are very expensive to operate and maintain. One of the standout qualities of the new trailer is the intrinsically safe operating electronics meaning it is ideal on petrol chemical sites. The machine is equipped with a spark arrestor as standard on the latest new Volvo Tier Four Compliant diesel engine and on board AdBlue system. We opted to have a Chalwyn valve fitted as operating Diesel engines in hazardous environments is a serious safety risk. A release of flammable gas or vapour can occur at any time and be drawn into the engine’s air intake. Turning off the ignition in an emergency is just not enough as this won’t shut down the engine completely as it’s run on the external fuel source. The most effective way of shutting down a runaway diesel engine is with an automatic air intake shutoff valve. If there is a risk of explosion detected this is eliminated with an automatic air intake shut off valve. 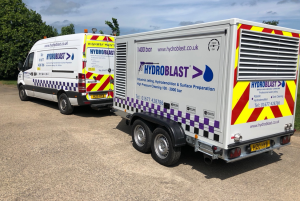 Hydroblast puts safety to its operators and customers its highest priority at all times as part of its OHSAS 18001 standards.The machine is fitted with a start/stop remote and also a remote (intrinsically safe) stop not just at the machine, but also available with the pump operator in case of an emergency.